This hive has two honey supers--nicely painted a honey color. I removed them both from the stack. This was not easy as the propolis and the comb sticking them together was amazing. And I was doing this in the worst humidity and heat of the year, wearing my bee coat. So…then…I put the top super onto the bottom to let them continue their work there. It has some drawn comb and a small amount of nectar stored in it. On top of that, I placed a triangle escape board. The top super is full of capped honey and bees. It was SO HEAVY that I had to really work to get it on to the top of the stack. 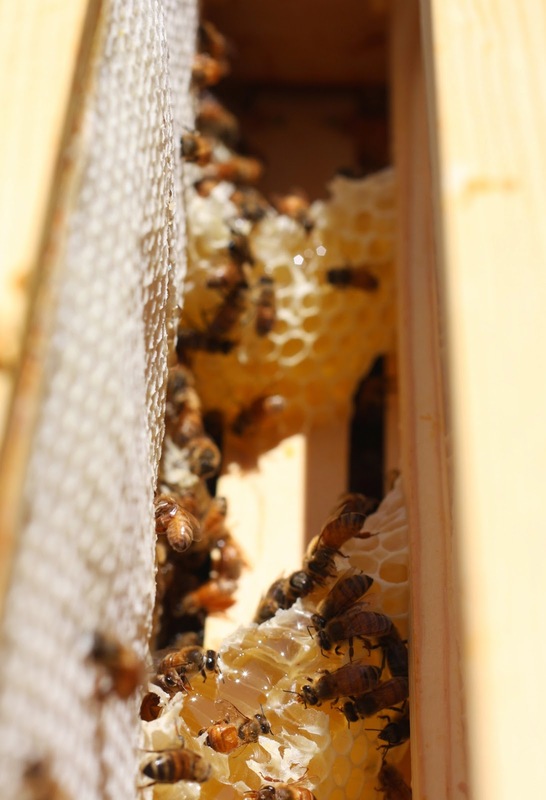 The girls will migrate downward, but be unable to get back up into the honey super. And after 24 hours--this afternoon, if the thunderstorms are not too bad-I will go and bring this box in. YES! Honey!! 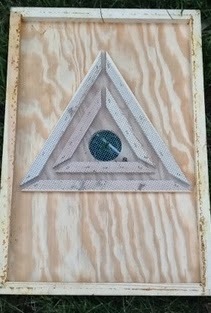 This is a triangle escape board. This is the side that faces down into the main hive boxes. The bees from the super go in the round hold and find their way out the two triangle "mazes." And here is the fun bee fact: Bees, when they hit a wall will always turn to the right. This makes it hard for them to find their way back through the triangles up into the super once they are out. There will be many bees clinging to this trying to get back up there when I remove it. This method of bee removal takes a little time, but is easier and more effective than brushing and shaking them off. I am also trying not to use much smoke on the supers as I don't want smokey honey. Meanwhile, in the newer hive: The super has some capped honey which I will harvest also. 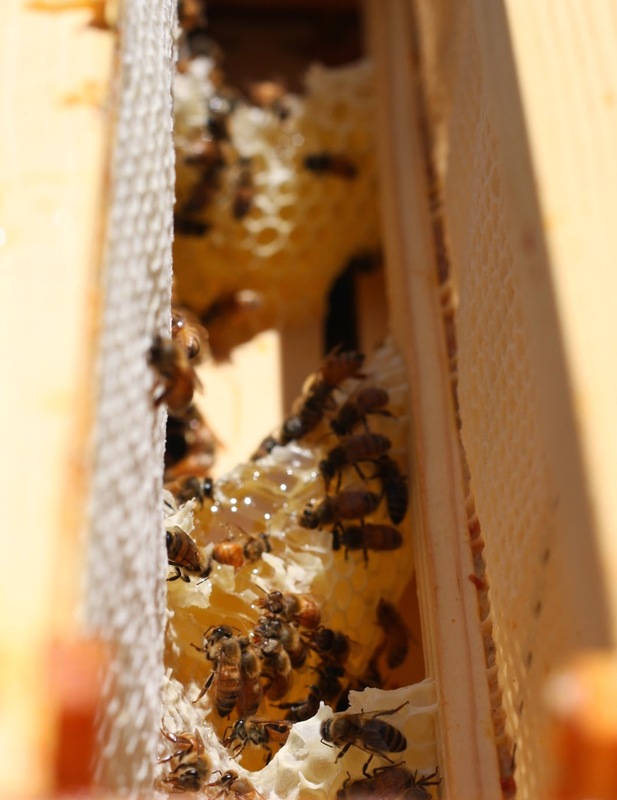 A frame is removed here, and looking in, the girls are connecting the super to the hive body with loads of lovely comb honey. I will need to take out a sharp knife and a bowl to collect this and try to keep the frames unstuck. This is a nice capped frame of honey on the left.